2Department of Agronomy, University of Agriculture, Faisalabad-38040, Pakistan. 3Department of Botany, University of Agriculture, Faisalabad-38040, Pakistan. 4College of Food and Agricultural Sciences, King Saud University, P.O. Box 2460, Riyadh "451, Saudi Arabia. Micronutrients are vital for plant growth and human health. Soil and foliar applications are the most prevalent methods of micronutrient addition but the cost involved and difficulty in obtaining high quality micronutrient fertilizers are major concerns with these in developing countries. Micronutrient seed treatments, which include seed priming and seed coating, are an attractive and easy alternative. Here in this review, we discuss the potential of micronutrient seed treatments for improving crop growth and grain nutrient enrichment. Micronutrient application through seed treatments improves the stand establishment, advances phenological events, and increases yield and micronutrient grain contents in most cases. In some instances, seed treatments are not beneficial; however, the negative effects are rare. In most cases, micronutrient application through seed treatment performed better or similar to other application methods. Being an easy and cost effective method of micronutrient application, seed treatments offer an attractive option for resource-poor farmers. Keywords: Boron, cobalt, grain enrichment, manganese, molybdenum, seed coating, seed priming, zinc. 'Hidden hunger', mineral deficiency in edible grains, is a major health issue for human being in most of the developing world (Buyckx, 1993; Ramalingaswami, 1995). For example, dietary Zn deficiency in humans may result in loss of immunity, poor wound healing and dermatitis (van Campen, 1991). Zn nutrition, however, helps to improve resistance to some infectious diseases such as diarrhoea (Black, 1998; Fuchs, 1998) and immunity (Shankar and Prasad, 1998). Improving plant micronutrient status in situations where micronutrient nutrition is inadequately supplied from the soil would increase yield. This, however, requires application of higher doses of fertilizer to soils because of low nutrient-use efficiency (Singh, 2007). In crop plants, micronutrients may be applied to the soil, foliar sprayed or added as seed treatments. Although the required amounts of micronutrients can be supplied by any of these methods, foliar sprays have been more effective in yield improvement and grain enrichment; but high cost has restricted its wider adaption, particularly by resource-poor farmers (Johnson et al., 2005). Moreover, foliar application occurs at later growth stages when crop stands are already established. Seed treatment is a better option from an economical perspective as less micronutrient is needed, it is easy to apply and seedling growth is improved (Singh et al., 2003). Seeds may be treated with micronutrients either by soaking in nutrient solution of a specific concentration for a specific duration (seed priming) or by coating with micronutrients. Seed invigoration is a relatively new term and has been interchangeably used for both methods of seed treatment (Farooq et al., 2009). Although several comprehensive reviews on seed enhancements (Taylor et al., 1998), priming (McDonald 2000), on-farm priming (Harris, 2006) and invigoration (Farooq et al., 2009) for successful crop production under optimal and stress (Farooq et al., 2010) environments are available, in this review, we discuss micronutrient application through seed treatments. The potential and prospects of seed treatments with Zn, B, molybdenum (Mo), manganese (Mn), copper (Cu) and cobalt (Co) for improving growth, yield and grain enrichment of respective nutrients are discussed. In seed priming, seeds are partially hydrated to allow metabolic events to occur without actual germination, and then re-dried (near to their original weight) to permit routine handling (Bradford 1986). Such seeds germinate faster than non-primed seeds (Farooq et al., 2006, 2009). In micronutrient seed priming (nutripriming), micronutrients are used as osmotica (Imran et al., 2004; Singh 2007). Primed seeds usually have better and more synchronized germination (Farooq et al., 2009) owing simply to less imbibition time (Brock-lehurst and Dearman, 2008; McDonald, 2000; Taylor et al., 1998) and build-up of germination-enhancing metabolites (Basra et al., 2005; Farooq et al., 2006). Several reports indicated the potential of nu-tripriming in improving wheat yields (Marcar and Graham, 1986; Wilhelm et al., 1988), rice (Peeran and Natanasabapathy, 1980) and forage legumes (Sherrell 1984). However, one report suggests seed damage and germination inhibition by priming at higher nutrient concentrations (Roberts 1948). In the following sections, seed priming using Zn, B, Mo, Mn, Cu and Co is discussed. With increases in soil pH, Zn solubility in soil and its uptake decreases concomitantly. In several crops, higher soil phosphorus (P) contents may induce Zn deficiency (Chang, 1999; Foth and Ellis, 1997). Poor growth and small brown spots on leaves are common symptoms in rice and maize plants grown on Zn-deficient soils (Marschner, 1995; Sharma, 2006). Zn-deficient fruit trees may have profuse growth at shoot tips with rosette-like appearance (Marschner, 1995). Interveinal leaf chlorosis and leaf mottling has also been observed in Zn-deficient citrus trees (Chang, 1999; Marschner, 1995). Seed priming with Zn can improve crop emergence, stand establishment, and subsequent growth and yield. For example, priming Echinacea purpurea (L.) seed with 0.05% ZnSO4 solution increased germination and field emergence by 38 and 41%, respectively (Babaeva et al., 1999). Likewise, in common bean (Phaseolus vulgaris L.), seed priming with Zn significantly improved yield and related traits (Kaya et al., 2007). In barley (Hordeum vulgare L.), seed priming with Zn improved germination and seedling development (Ajouri et al., 2004). Ozturk et al. (2006) found that Zn in newly-developed radicles and coleoptiles during seed germination was much higher (up to 200 mg kg-1) thus highlighting the involvement of Zn in physiological processes during early seedling development, possibly in protein synthesis, cell elongation membrane function and resistance to abiotic stresses (Cakmak, 2000). In addition, higher seed Zn contents may better resist invasion of soil-borne pathogens during germination and seedling development thus ensuring good crop stands (Marschner, 1995) and ultimately better yield. Seed priming substantially improved mineral (Zn and P) uptake and dry matter accumulation in barley and also enhanced water use efficiency by 44% in drought stressed plants (Ajouri et al., 2004). Harris and his team, in their preliminary trials, demonstrated that seed priming with ZnSO4 (0.4%) was effective to meet Zn requirements of wheat with a mean yield (mean of eight on-farm trials) increase of 615 kg ha-1 (21%) compared with crops from non-primed seed. Seed priming was also cost effective compared with soil application with benefit:cost ratio of 8 and 360 from soil application and seed priming, respectively (Harris et al., 2005). For chickpea, however, priming in a diluted solution of ZnSO4 (0.05%) was effective, yielding 10 to 122% more (with an average value of 48% from nine trials) compared with non-primed seeds with a benefit:cost ratio of 1500 (Harris et al., 2005). In maize, priming in 1% ZnSO4 solution (for 16 h) substantially improved crop growth, grain yield and grain Zn content (Harris et al., 2007). Results of seven field trials showed yield increase of 27% with seed priming compared with non-priming controls (Table 1; Harris et al., 2007). It is interesting to note that the benefit:cost value was substantially higher from Zn priming compared to soil application (Harris et al., 2007). The same team, in a series of on-farm trials, reported a 14% increase in wheat yield after seed priming with 0.3% Zn (Table 1), whereas chickpea yield increased by 19% after seed priming with 0.05% Zn. In addition to increased yield, seed priming with Zn increased grain zinc content by 12% in wheat (mean of three trials) and by 29% in chickpea (one trial) (Harris et al., 2008). 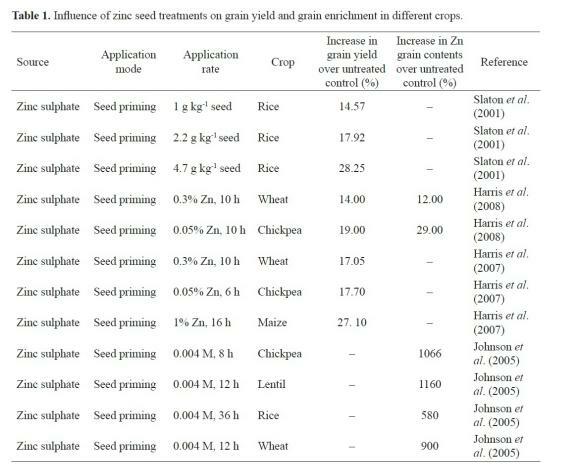 Similarly in rice, seed treatment with Zn substantially improved growth and grain yield, which was cost effective and economically more viable than soil application and no application (Slaton et al., 2001). Likewise in another study, seed priming with Zn was more effective in increasing grain yield of wheat grown on Zn-deficient soils than foliar and soil application nonetheless seed priming did not affect the grain Zn concentration in contrast to foliar and soil application (Yilmaz et al., 1997, 1998). Seed soaking in Borax (0.50%) along with ZnSO4 (0.25%) improved stand establishment and growth of papaya (Carica papaya L.) in the field (Deb et al., 2010). Kaur et al. (2009) also reported improved germination of Chlorophytum borivilianum (L.) from seeds soaked in Zn (ZnSO4) for 12 h. Likewise, seed soaking with solutions of Zn-EDTA and fritted Zn improved yield and Zn uptake; however, both sources differed in their efficiency to uptake Zn (Kang and Okoro, 1976). In another study, seed priming with ZnSO4 (0.1%) for 24 h increased stand establishment by 29% compared with the untreated control (Foti et al., 2008). In a two-year trial on chickpea, lentil, rice and wheat, seed priming with Zn had no effect on grain yield (Johnson et al., 2005). Chickpea seeds primed with Zn failed to emerge at all experimental sites, resulting in complete crop failure. However, in the second season, seeds germinated with the same priming treatments, but there was no yield gain. Nonetheless, priming seeds in Zn solution increased grain Zn contents in all tested crops (Johnson et al., 2005). The failure of crop stand establishment during the first season indicates the risk involved in practicing micro-nutrient priming. It would be wise to optimize micro-nutrient seed priming treatment in the laboratory and then test in soil for germination prior to priming the whole batch (Johnson et al., 2005). Despite the above beneficial effects of Zn-priming, some studies have indicated that seed priming with Zn may not be effective in fulfilling Zn requirements of different crops. For example, in kidney beans seed priming with Zn alone did not fulfil crop Zn requirements (Rasmussen and Boawn, 1969). However it depends on soil Zn status; for instance, in the case of moderate deficiency, seed priming was a cost-effective method of Zn application (Harris et al., 2007, 2008; Slaton et al., 2001), while in the case of severe deficiency, seed priming may not meet the crop Zn requirement (Rasmussen and Boawn, 1969; Rehman H et al., 2012). Deficiency of B causes severe reductions in crop yield, due to severe disturbances in B-involving metabolic processes, such as metabolism of nucleic acid, carbohydrate, protein and indole acetic acid, cell wall synthesis, membrane integrity and function, and phenol metabolism (Dell and Huang, 1997; Tanaka and Fujiwar, 2008). B is also functionally associated with one or more of the processes of calcium utilization, cell division, flowering and fruiting, carbohydrate and nitrogen metabolism, disease resistance, water relations, and catalyst for certain reactions (Sprague, 1951). Common B deficiency symptoms in crop plants are interruption in flowering and fruiting (Ho, 1999) and poor yields, with deformed or discolored fruit or grain (Shorrocks, 1997). However, B deficiency symptoms vary amongst species. For instance, in soybean (Glycine max L.) or groundnut (Arachis hypogaea L.), B deficiency causes empty seeds also known as 'hollow heart'. In black gram (Vigna mungo L.), no symptoms of B deficiency may be visible in seeds, yet grain yield may be reduced by up to 50% (Keerati-Kasikorn et al., 1987). Concentration of priming solution is perhaps the most critical factor while priming with B. For example in Russia, experiments on seed priming in boric acid solutions (2 to 20 mM) had both germination stimulating and suppressing effects in several crops including turnip (Brassica rapa L.), sunflower (Helianthus annuus L.), soybean, sugarbeet (Beta vulgaris L.), alfalfa (Medicago sativa L.), wheat and barley (Shorrocks, 1997). Seeds (of the above species) primed in the most concentrated B solution (0.5%) were unable to emerge. Likewise, rice seeds primed in 0.5% B solution did not germinate (Rehman A et al., 2012), whereas priming in 0.001% and 0.1% B solutions improved stand establishment in rice (Rehman A et al., 2012). In another recent study, seeds of fine-grain aromatic rice cultivars Super Basmati and Sha-heen Basmati were primed in aerated B (0.001, 0.01, 0.1 and 0.5%) solutions (Farooq et al., 2011a). Stand establishment improved substantially from seed priming in 0.001 and 0.01% solutions; beyond this, emergence was suppressed (Farooq et al., 2011a). However in papaya, substantial improvement in germination and early seedling growth was observed when seeds were primed in 2 mg L-1 B solution for 6 h (Deb et al., 2010). In oats (Avena sativa L.), seed priming with B (0.02% solution of H3BO3) had no marked effect on seed germination, yet tillering, panicle length and grain weight were increased by seed priming with B contributing to a grain yield increase of 8.42% compared with untreated seeds (Table 2; Saric and Saciragic, 1969). Similarly in rice, rates of leaf emergence, leaf elongation and tiller appearance substantially improved in seedlings raised from seeds primed in 0.001% B solution (Rehman A et al., 2012). Seed priming with B also has a profound influence on advanced growth stages. In a study on pea (Pisum sativum L.), Kumar et al. (2008) reported increased plant height, fruiting and pod yield when seeds were primed in 0.5% B solution with a concomitant reduction in days to 50% flowering. As for Zn, there was no visible effect of seed priming with B on yields of chickpea, lentil, rice or wheat; yet priming seeds in B solution increased grain B content in all tested crops (Table 2; Johnson et al., 2005). 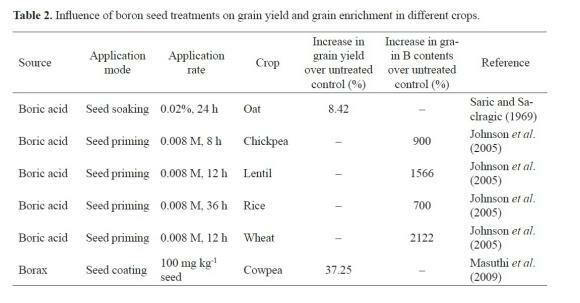 However in pigeonpea, B application through seed treatment (4 g kg-1 seed) was more effective and economical in increasing seed yield by 10.53% compared with the control; soil application (10 kg ha-1) increased yield by 5.26% (Malla et al., 2007). Although seed priming with B is the most convenient and cost-effective method of B application, solution concentration is of vital significance and must be tested and optimized before field application. In plants, Mo is involved in nitrogen nutrition and assimilation. Mo helps non-legume plants to use nitrates taken up from the soil. In plants with insufficient Mo, nitrates accumulate in leaves, which are then not assimilated into proteins. In legumes, Mo serves an additional function: to help root nodule bacteria to fix atmospheric N (Campo et al., 2000). Mo deficiency symptoms are often similar to N deficiency. In legumes, the nitrogen-fixing ability of soil microorganisms is severely hampered by Mo deficiency, rendering them N-deficient. 'Blue-chaff' in oats, 'yellow-spot' in citrus and 'whiptail' in cauliflower are some other examples of Mo deficiency (Chang, 1999). Several studies indicate that seed treatment is a more effective method for Mo application than soil application (Donald and Spencer, 1951; Johansen et al., 2006a,b). For instance, in 48 trials conducted in eastern India, Mo applied through seed priming increased mean yield by 17-22% compared with the control (without Mo) and 20-25% when Mo was applied to the soil (Johansen et al., 2006a). 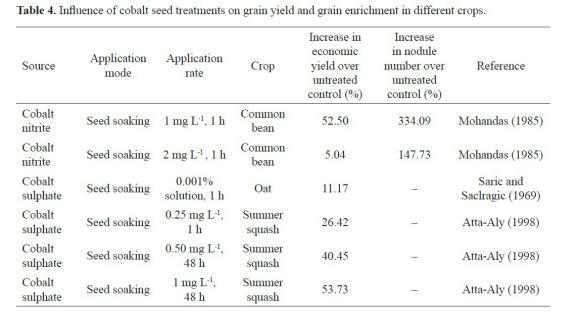 Likewise, Mo application through seed treatment (4 g kg-1 seed) was more effective and economical in increasing seed yield by 15.79% over no application control; soil application (1.5 kg ha-1) increased yield by 10.53% (Malla et al., 2007). In a Mo-deficient soil, priming of subterranean clover (Trifolium subterraneum L.) seeds in 0.1 or 1% sodium molybdate solution was as equally effective as soil application in improving growth and yield. At application levels in excess of the requirements for maximum yield, seed priming resulted in higher Mo and N contents in grains than equivalent soil applications (Donald and Spencer, 1951). Common bean seeds primed in sodium molybdate improved nodulation, dry matter accumulation, nitrogen fixation and yield (Table 3; Mohandas, 1985). Kumar Rao et al. (2004), in a pot study on chickpea, reported a yield increase of 27% by seed priming with Mo (0.5 g l-1 solution of sodium molybdite) for 8 h compared with Mo soil application. However in a field trial, the yield increase in chickpea was 20% from the same treatment (Khanal et al., 2005). The efficiency of seed priming with Mo may be further enhanced by adding rhizobium to the priming solution. For instance, in multi-locational trials at farmers' fields in Bangladesh, yield increases were 37%-90% over untreated control and up to 50% more than water-soaked control (Johansen et al., 2006b). Likewise, in green gram (Vigna radiata L.), seed priming in sodium molybdate and rhizobia significantly improved nodulation, N fixation, nutrient uptake, plant growth and crop yield. Combining seed treatments also increased fertilizer application efficiency, indicating better use of resources (Pattanayak et al., 2000). Although incorporation of rhizobial strains in the priming media was synergistic, the protocol should be fine-tuned for individual crops and micronutrient requirements. In crux, Mo application through seed priming is more effective, pragmatic and economical compared with soil application in fulfilling Mo requirements of many crops, however its integration with rhizobia needs to be further investigated and fine-tuned. Manganese (Mn) plays a vital role in nitrogen metabolism, photosynthesis, and forms several other compounds required for plant metabolism (Stout and Arnon, 1939). Mn deficiency is usually indicated by interveinal chlorosis; however, in some species, maturity is delayed (Park et al., 1999). Under conditions of acute Mn deficiency, brown necrotic spots may appear on leaves leading to premature leaf shedding. White and grey spots on some cereal leaves are signs of Mn deficiency (Chang, 1999; Stout and Arnon, 1939). Priming wheat seeds in MnSO4 solutions significantly improved growth, grain yield and grain Mn contents (Khalid and Malik, 1982). Grain yield and grain Mn contents increased linearly with increasing priming solution concentration up to a maximum of 0.2% MnSO4 solution for 12 h (Table 3; Khalid and Malik, 1982). Increased grain yield and grain Mn content in wheat from priming with MnSO4 has also been observed in other studies (Marcar and Graham, 1986). Mn seed priming also has the potential to improve stand establishment. For instance, priming Echinacea purpurea (L.) seed with 0.1% MnSO4 solution increased germination by 36% and field emergence by 27% over untreated control (Babaeva et al., 1999). Of the studies conducted on seed priming with Mn, all have indicated substantial improvement in stand establishment, growth, yield, and grain enrichment, compared with soil application (Babaeva et al., 1999; Khalid and Malik, 1982; Marcar and Graham, 1986). Copper (Cu) is involved in carbon assimilation and nitrogen metabolism; its deficiency results in severe growth retardation. Cu is also involved in lignin biosynthesis, which not only provides strength to cell walls but also prevents wilting (Taiz and Zeiger, 2010). Leaf chlorosis, stunted growth, and stem and twig dieback are common deficiency symptoms of Cu (Chang, 1999; Osotsapar, 1999; Stout and Arnon, 1939). Priming wheat seeds in CuEDTA solution (0.04 to 0.16 kg Cu ha-1) substantially increased grain yield, but suppressed seedling emergence (Malhi, 2009). Priming wheat seeds in CuEDTA solution at very low rates (0.04 kg Cu ha-1) prevented Cu deficiency in wheat with significant increases in seed yield (Malhi, 2009). 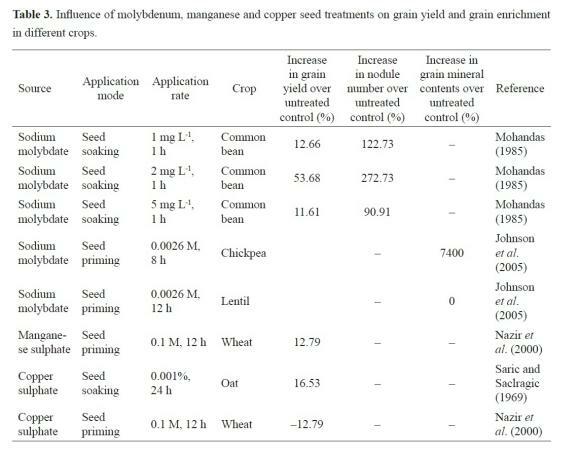 In another experiment on oats, seed priming with Cu (0.001% solution of CuSO4) had no effect on germination; yet the number of grains (per panicle) and grain weight increased resulting in yield increase of 16.53% compared with untreated control (Table 3; Saric and Saciragic, 1969). However, in a recent study, seed priming with copper sulphate (0.1%) for 24 h improved stand establishment by 43% compared with the untreated control (Foti et al., 2008). Although cobalt (Co) is beneficial for some plants, for others it is essential; for instance, in legumes Co is required for nitrogen fixation. Co affects metabolism and plant growth and is an essential component of several enzymes and co-enzymes (Palit et al., 1994). Its beneficial effects include retardation of leaf senescence, inhibition of ethylene biosynthesis, and stimulation of alkaloid biosynthesis (Palit et al., 1994). In pigeonpea (Cajanus cajan L.), seed priming with cobalt nitrate substantially increased plant height, branch and leaf numbers, dry matter accumulation, and grain yield (Raj, 1987). Likewise in peanut, seed priming with cobalt nitrate significantly increased growth, pod yield, shelling percentage, seed weight and harvest index (Raj, 1987). In both pigeon pea and peanut, leghemoglobin content and nodule density increased (Raj, 1987). In summer squash (Cucurbitapepo L.), seed priming with cobalt sulfate substantially increased dry matter accumulation, femaleness and fruit yield compared with water-soaked seeds (Table 4; Atta-Aly, 1998). In addition, priming with CoSO4 triggered endogenous ethylene synthesis during early seedling stages (14 days after sowing), which continued until flower initiation (30 days after sowing). Seeds soaked in 0.25, 0.50 and 1.00 ppm CoSO4 produced 26, 40, and 56% more fruit yield, respectively, than the control (Atta-Aly, 1998). In common bean, priming seeds with cobalt nitrite at 1 and 5 mg L-1 significantly improved nodulation, dry matter, nitrogen and grain yield (Mohandas, 1985). In oat, seed priming with Co (0.001% solution of CoSO4) had no effect on germination; yet panicle length, number of grains (in a panicle) and grain weight increased contributing to substantial yield increase of 11.17% compared with untreated control (Table 4; Saric and Saciragic, 1969). Seed priming with a combination of micronutrients (0.16 mg g-1 Mo as sodium molybdate and 0.008 mg g-1 Co as cobalt chloride) and rhizobium significantly improved nodulation, N fixation, nutrient uptake, plant growth and yield (Pattanayak et al., 2000). Combining seed treatments also increased fertilizer application efficiency, indicating better use of resources (Pattanayak et al., 2000). Although seed priming with Co at specific concentrations for specific durations effectively improves plant performance, further studies are needed to establish these effects on plant performance. Seed priming is affected by various environmental variables and other factors (Farooq et al., 2009). Oxygen, temperature and solution concentration (water potential) are amongst the most important factors affecting seed priming (Corbineau and Come, 2006). In seed priming, oxygen supply during seed soaking improved its effectiveness (Farooq et al., 2009). However, the effects of aeration during seed priming have not been considered in previous studies on nutrient priming. In our recent research, there was a substantial difference in the performance of aerated vs. non-aerated solutions during seed priming in various crops. Provision of aeration (oxygen) improved seed performance upon sowing (Farooq et al., 2011b). Temperature of the priming media also regulates the effectiveness of seed priming. For example, low temperature during priming can delay the physiological processes of germination, even though seeds absorb water in optimal amounts (Lee et al., 1998). Nonetheless, lower temperatures lessen the possibility of microbial contamination during priming (Lee et al., 1998). Solution concentration and solution water potential are perhaps the most important factors determining the effectiveness of seed priming. This has even more significance for micronutrient seed priming as the range between deficiency and toxicity of micronutrients is very narrow (Farooq et al., 2011a; Rehman A et al., 2011; Shorrocks, 1997). Seed germination is initiated when a critical level of water potential is reached in the seed. Although inter- and intra-specific variation exists, germination most often starts when seed water potential ranges from 0 to -2 MPa (Corbineau and Come, 2006; McDonald, 2000). Seeds with hard seed coats or dormancy may be exceptions. In seed coating, materials that influence the seed or soil at the seed-soil interface are applied to the seed coat. Seed coating generally refers to the application of finely-ground solids or liquids containing dissolved or suspended solids to form a more or less continuous layer covering the natural seed coat; it includes pelleting and many other seed treatments (Scott, 1989). Strictly speaking, seed pelleting involves the addition of inert materials to modify seed shape and size for precision planting, while in seed coating, useful materials like microorganisms, plant growth regulators, nutrients and other chemicals are adhered around the seed with the help of some sticky material. However, both of these terms are being used interchangeably. The success and effectiveness of seed coating with micronutrients depends on the nutrient used, coating material, soil type, moisture and fertility status, and the nutrient:seed ratio (Halmer, 2008). 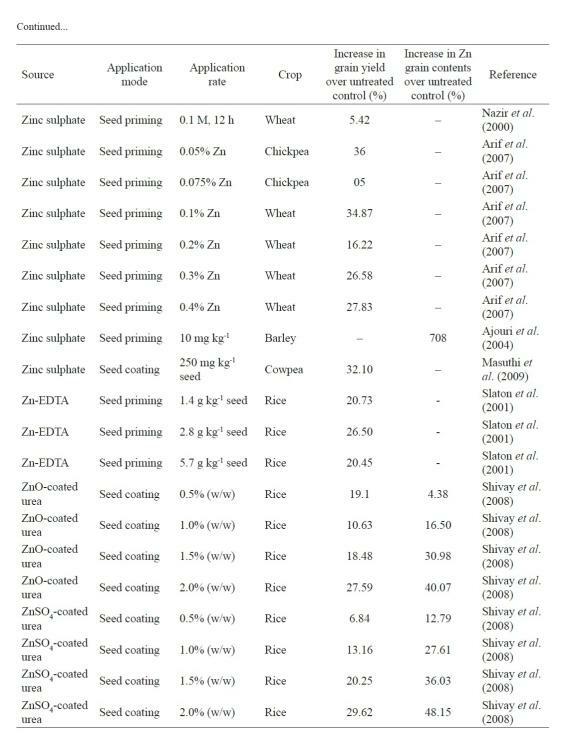 There are several reports available on Zn seed coating, which show promise for crop improvement (Masuthi et al., 2009; Singh, 2007). For example, Zn seed pelleting significantly increased seed yield and yield-related traits in cowpea (Vigna unguiculata L.). Seed pelleted with ZnSO4 (250 mg kg-1 seed) produced significantly higher 100 seed weights, seed weight/ plant leading to 32.1% seed yield increase over non-pelleted control (Masuthi et al., 2009). In a series of experiments, seed coating with commercially-available formulations 'Teprosyn-ZnP' or 'Teprosyn-Zn' effectively corrected Zn deficiencies and improved growth and grain yield of sunflower, maize, wheat, soybean and peanut (Singh, 2007). However, further research must be initiated in this regard. In cowpea, seed pelleting with Borax (100 mg kg-1 seed) substantially improved pod weight, seeds/pod and pod weight/plant resulting in 37.25% pod yield gain over non-pelleted control (Masuthi et al., 2009). In rice, none of the B sources (borax, boric acid and sodium tetraborate) used for seed coating and B:seed ratios (0.5-2 g kg-1 seed) improved the germination (unpublished data). However further work with a range of B:seed ratios is needed to explore its possible worth. Several studies indicated the effectiveness of Mo seed coating (Biscaro et al., 2009; Ramesh and Thirumuru-gan, 2001). For instance, Biscaro et al. (2009) treated common bean seeds with Mo (80 g ha-1) resulting in increased relative chlorophyll index, pod number, seed weight and grain yield. Soybean seeds pelleted with 250 mg ammonium molybdate + 500 mg ferrous sulfate kg-1 were most effective in improving plant height, leaf area index, dry matter production and growth rate (Ramesh and Thirumurugan, 2001). Likewise in field experiments evaluating the effectiveness of several pelleting materials to increase cowpea and soybean yields on acid soils, the benefits from Mo application, alone or in combination with rock phos- phate, were comparable or greater than the effect of liming (Rhodes and Nangju, 1979). There are, however, several reports indicating no improvement or toxicity from Mo seed-coating. For example, bacterial survival, nodulation and N fixation were strongly suppressed when seeds were pelleted with sodium molybdate. About 99% of inoculated bacteria died 4 days after seed treatment with inocu-lant and Mo (Burton and Curley, 1966). Several other researchers observed suppressive effects of salts used as Mo sources on bradyrhizobium (Albino and Campo, 2001; Campo et al., 2000). Although some reports indicate that Mo seed coating is effective in improving crop performance, it may have toxic effects from bacterial strains used for inoculation. Therefore, the efficacy of Mo seed coating with bacterial strains must be evaluated before using Mo seed coating. â¢Â storage potential of nutriprimed seedsâprolonged storage of primed seeds may be critical for technology transfer and marketing of primed seeds. Endeavour Research Fellowship for Postdoctoral Research to M. Farooq from The Department of Education, Science and Training, Australia is greatly acknowledged.